A much talked-about rezoning for Empire Boulevard, the boundary between Crown Heights and Prospect Lefferts Gardens, has been roiled by dissent from hardline anti-gentrification group Movement to Protect the People. But while Airbnb host-turned-anti-displacement-advocate Alicia Boyd is throwing racially charged bombs at the community board and local politicians and holding up an effort to rezone the wasteland of Empire Boulevard, by-right projects nearby like 902 Franklin Avenue and 1 Sullivan Place are moving along. And now we can add 109 Montgomery Street to that list. Earlier today, an application was submitted to the Department of Buildings to erect a 12-story, 173-unit apartment building – likely rentals – mid-block between Washington and Franklin avenues. The 173 apartments will be spread over 132,000 square feet of net residential space, for an average unit size of 760 square feet, with between 11 and 16 units per floor. No retail is allowed, and the developer is planning a 70-car garage – the absolute minimum required by zoning. 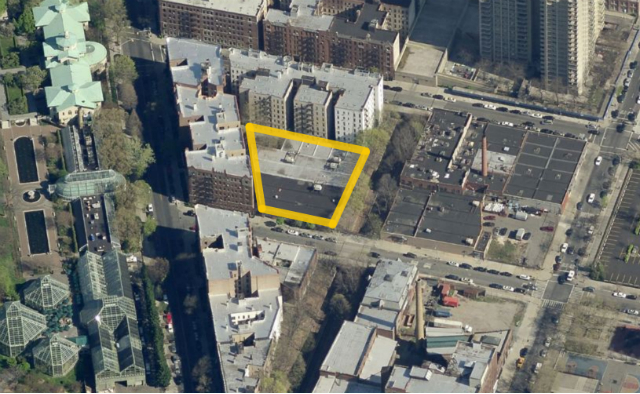 As with 902 Franklin, just across the Franklin Avenue shuttle train open cut from this lot, Karl Fischer is listed as the architect, and Cornell Realty appears to be the developer, with Shifra Hager listed as the owner. A recent deed transfer has yet to show up in property records. The last sale appears to have been in 1989, when the vacant lot was acquired by the Brooklyn Botanic Garden.